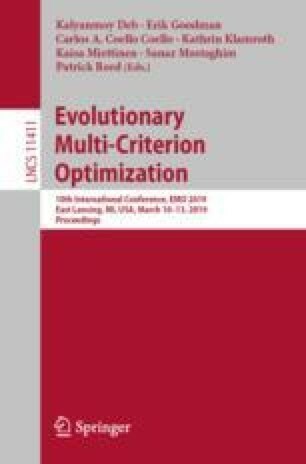 In this paper we propose a Diversity-Indicator based Multi-Objective Evolutionary Algorithm (DI-MOEA) for fast computation of evenly spread Pareto front approximations. Indicator-based optimization has been a successful principle for multi-objective evolutionary optimization algorithm (MOEA) design. The idea is to guide the search for approximating the Pareto front by a performance indicator. Ideally, the indicator captures both convergence to the Pareto front and a high diversity, and it does not require a priori knowledge of the Pareto front shape and location. It is, however, so far difficult to define indicators that scale well in computation time for high dimensional objective spaces, and that distribute points evenly on the Pareto front. Moreover, the behavior of commonly applied indicators depends on additional information, such as reference points or sets. The proposed DI-MOEA adopts a hybrid search scheme for combining the advantages of Pareto dominance-based approaches to ensure fast convergence to the Pareto front, with indicator based approaches to ensure convergence to an evenly distributed, diverse set. In addition, it avoids the use of complex structure and parameters in decomposition-based approaches. The Euclidean distance-based geometric mean gap is used as diversity indicator. Experimental results show that the new algorithm can find uniformly spaced Pareto fronts without the involvement of any reference points or sets. Most importantly, our algorithm performs well on both the hypervolume indicator and IGD when comparing with state-of-the-art MOEAs (NSGA-II, SMS-EMOA, MOEA/D and NSGA-III). This work is part of the research programme Smart Industry SI2016 with project name CIMPLO and project number 15465, which is (partly) financed by the Netherlands Organisation for Scientific Research (NWO).